Sprint's first 4G phone will be released on June 4, Sprint CEO Dan Hesse revealed in a special event Wednesday. The much-anticipated HTC EVO 4G will be priced at $200 with a new 2-year contract ($450 unsubsidized). EVO 4G users will pay a minimum of $70 per month (with Sprint's "Everything Data Plan), as well as an additional $10 per month for 4G coverage (dubbed the "Premium Data Add-on"). The additional $10/month charge will be mandatory for all EVO 4G users, regardless of whether they live in a 4G coverage area or not. There is a benefit, though--according to Phone Scoop, the extra $10 premium data add-on means no data cap for either 3G or WiMAX (some of Sprint's 3G-only services retain a 5GB data limit). 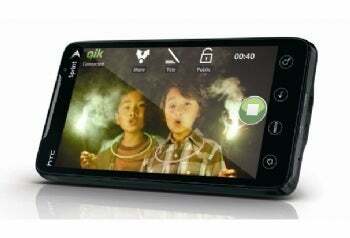 The HTC EVO 4G features a 4.3-inch (800 by 480 pixel) touch screen, two cameras (an 8-megapixel camera on the back and a 1.3-megapixel camera on the front, presumably for video conferencing), and a kickstand for viewing the phone on a desk or table. The phone runs Android 2.1 ("Sense"), and features a multitasking manager called "Leap." Similar to Google's Nexus One phone, the HTC EVO 4G has four virtual touch-sensitive navigation buttons (Home, Menu, Back, Search). The EVO 4G has a 1GHz Snapdragon processor, and can be used as a mobile hotspot--users will be able to connect up to eight Wi-Fi-enabled devices. However, this functionality will cost you extra--$30 per month, according to Sprint. Other notable features of the EVO 4G announced today: the phone will support simultaneous voice and data, will ship with Youtube HQ and Qik (a video-chat app).